I guess I've been MIA for the entire summer... As intriguing as this off-season was, especially for football, I just haven't had any brilliant thoughts that I wanted to blog about. But now that BYU football has actually started, the hype train is starting up again, and I guess I should get on board! Even though the Arizona game turned out to be a nail-biter, I wasn't too worried until we fell behind in the 4th quarter. BYU was playing very well overall, even though they weren't putting a lot of points on the board. I think this team is a huge improvement over last year in many ways. Here are a few of my observations from game #1. 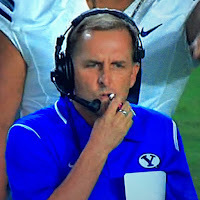 First, Ty Detmer really is a GENIUS. Great play calling, good time management, and only one 3-and-out for the offense is a HUGE step up from what happened under Anae (I never liked that guy, for the record... thank goodness he's Virginia's problem now). Second, Taysom is definitely BACK! Yes, I was one of those people who verbally shouted "DON'T GET HURT!" every time Taysom ran with the ball. Hopefully the anxiety will die down as the season goes on, but it was great to see him on the field again. Call me crazy if you want, but I think he looked better in the Arizona game than he did pre-injury in the Nebraska game last year. Calmer and more poised, he made faster & better decisions and didn't look like he was playing to not get injured. I'm glad he's willing to "leave everything out there" for his last year. That kid (or I guess I should say 26-year-old man) is tough as nails, and I'm so glad he's on our team. Also gotta give a shout-out to our other returning star, J-Swagg Daddy himself, Jamaal Williams. They say absence makes the heart grow fonder, and his almost 2 years away from football has done him a world of good. He's off to a great start for his goal of becoming BYU's all-time leading rusher, and he's certainly doing it with style! Third, our defense is GOOD. They shut out Arizona, certainly not a cupcake team, for almost 3 whole quarters! The Arizona offense looked confused and just plain stuck in a rut. 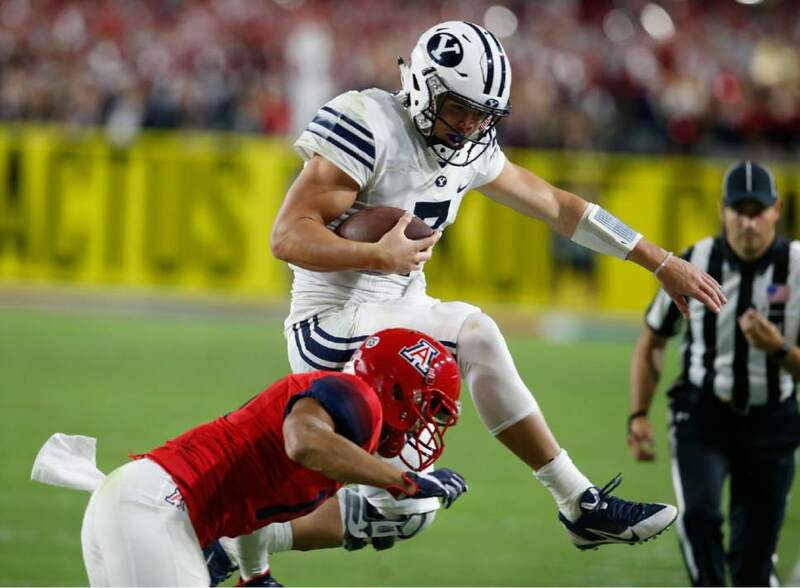 Francis Bernard, Fred Warner, Kai Nacua, Butch Pau'u... so many BYU players made brilliant plays. If not for a few assignment errors (should be easily correctable), we would have won that game by double digits. 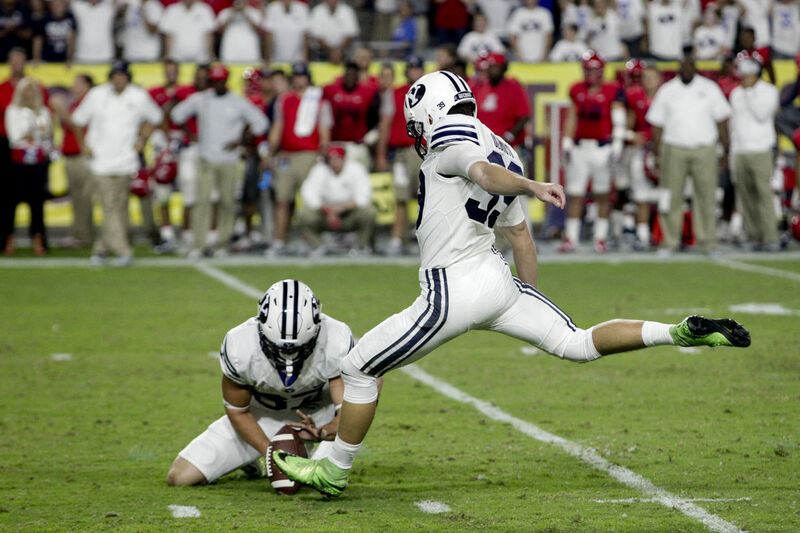 The moment Jake Oldroyd became a BYU legend. However, if we had won by double digits, the game wouldn't have come down to a kick. Good news is, maybe I don't have to be so panicked about the kicking game after all... Where did this Oldroyd kid come from?! When I realized the game was going to come down to a field goal, I was literally sitting on the floor, hugging my knees to my chest & rocking back and forth with my face in my hands, debating about whether to look at the TV screen or not. "We don't have a kicker, we don't have a kicker... We're gonna lose because we don't have a kicker!!!" But then green-cleated. 18-year-old walk-on Jake Oldroyd stepped up & took my fears away. The more I've learned about Oldroyd the last few days, the better the story gets. He wore his green high school cleats because he hadn't even been issued BYU cleats yet. The last field goal he kicked was in his junior year of high school. He was injured during fall camp, so he hasn't even practiced with the team yet. He originally wasn't even going to go to Arizona because he wasn't on the 2-deep. Now going into rivalry week, he's the starting kicker. You can't make this stuff up! As great as the Arizona game was, this week could be a whole different story. I still hate the rivalry... but it does seem different this year, in a good way. Maybe I'm just oblivious, or maybe things will change in the next few days, but I've seen fewer nasty comments than usual, and the banter seems to be more "all-in-good-fun". This video in particular is hilarious... but it's not cruel. 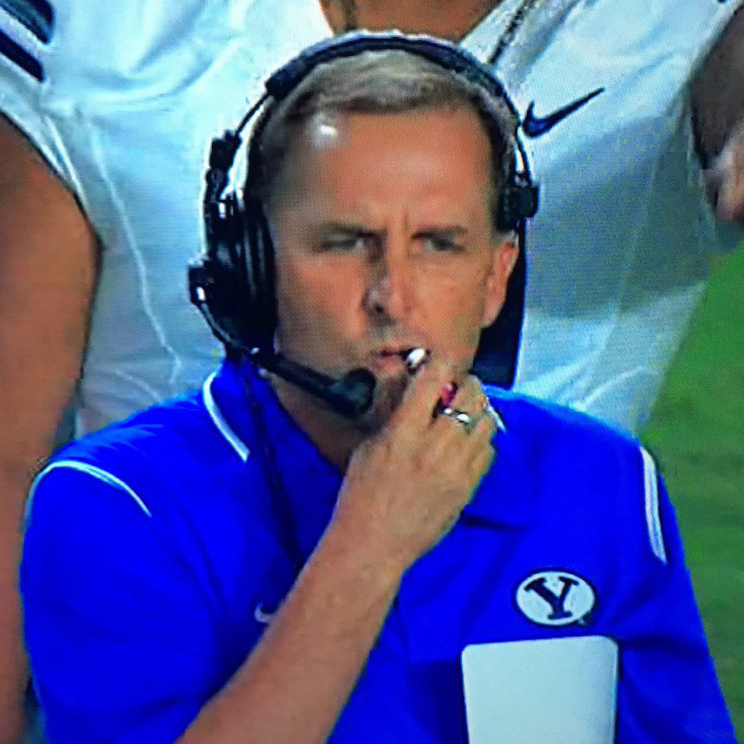 Could someone have pulled that off on BYU's campus instead? Probably... but I'm sure glad Cougar fans thought of it first! haha. I want to laugh during rivalry week... not scream into a pillow. Is that too much to ask? I have no idea what's going to happen on Saturday... it could definitely go in a million different directions. Of course I really hope BYU comes out on top, but even if they don't, I have high hopes for a good season this year against a super tough schedule. Go Cougs!